Trying to cope financially in retirement can be tough, but there are some things you can do to make your bank balance a bit more bearable to look at. Your home can be a great asset in retirement and you can use it to your advantage to make your retirement a bit more comfortable. These few tips should give you some ideas as to how you can utilise your home to help you in retirement. If you have a large house and find yourself pottering around wondering what to do with all that space, why not rent out a room to a family member, a friend, or even a lodger. You can do it on your terms and sign them up for a short tenancy so you can change your mind if you want to.If you live in a touristy area you might want to choose a particular season in which to rent out your home and restrict your lodging time to then. It’s a great way to make some extra money and as long as you vet the candidate beforehand it could offer some extra company. It is important to make sure you get proper references though from people who know them well. By the time you reach retirement you are likely to have accumulated a large amount of unwanted possessions. You will probably store most of these in your loft or somewhere out of the way. You may want to think about taking any valuable items or items you suspect are antiques to a specialist dealer. If you do have a large amount of unwanted bric-a-brac you could pitch a stand up outside your home one sunny day and put your items up for sale. 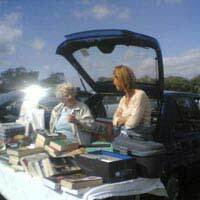 If there’s no room outside of your house you might want to think about attending a professional car boot sale. Another great way to get rid of unwanted items is to auction them on eBay, you will be surprised at what your unwanted items will fetch. With the recent boom in organic produce everybody is looking for a way to grow their own fruit and veg, but many don’t have the time. If you are a keen gardener and have ample room in your garden you may want to think about starting your own vegetable patch. Once you have a regular outflow of fruit and veg to sell you can advertise on a board outside your house what you have to offer. It may not start off as much but over time it can add up. If you are lucky enough to have one or even two parking spaces that are not attached to your house, you may wish to rent one out. A neighbour or someone close by might not have enough room for their own car and need the space. It might only be a small fee that you charge, but it will all add up to a nice little wage. Using your home to host events is a great way to meet up with your friends and earn some extra cash. Nowadays you do not have to restrict your party to tupperware and it can range from anything from make-up to jewellery. So why not invite a few of your closest friends around and make it a regular event. There are a number of ways your property can work for you in retirement that does not result in you having to remortgage your home or lend money against the property. Once you hit retirement you will find you have a lot of spare time on your hands, so why not be creative and start to benefit from your free time and the property you have.